Peter Verheyen recently announced his translation of Ernst Collin’s Pressbengel will soon be published in a letterpress limited edition. If you have not encountered his omnipresent online presence, you are the last. Start here: philobiblon.com. 1. 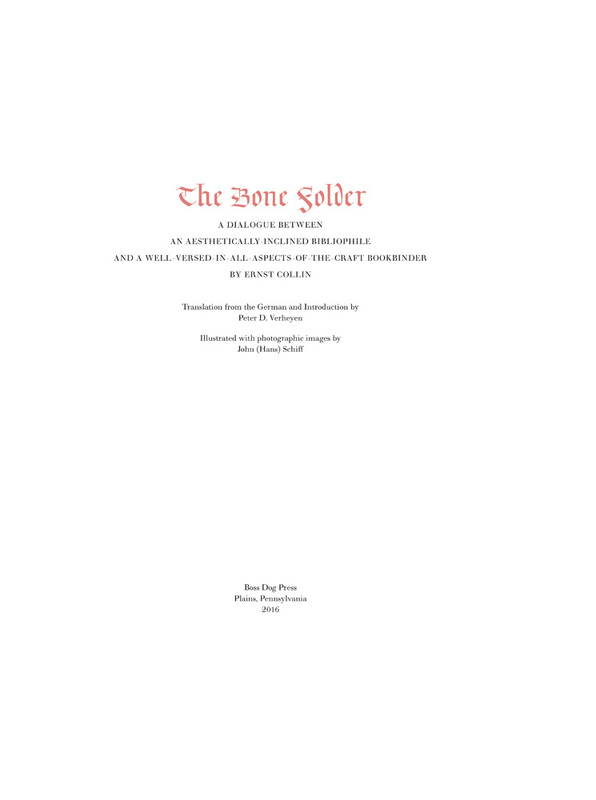 Why did you call this “The Bonefolder”? I’ve actually received questions about the choice of title since I first started with this project back in 2008/9. Collin was writing from the perspective of one for whom the German bookbinding tradition was their DNA, despite the anglophilic predilections of the firm of his family – the court bookbinders of W. Collin in Berlin. All binding traditions have their own unique tools or techniques, and in the German tradition the pressbengel seems to be one of those. The image below from Paul Adam’s Lehrbücher der Buchbinderei: Die einfachen handwerksmässigen Buchbinderarbeiten ohne Zuhilfenahme von Maschinen (1924), a very basic introduction to binding without the use of „machines“ shows the binder tightening the screws of a German backing press using a pressbengel. The Pressbengel had been translated into Czech (1925) and Italian (1996) before I started with my mine. In Czech the title translates as “Wrench” and in the Italian it was given as the “About the Art of Bookbinding,” so there was precedent for a retitling. Collin’s text is iconic in the German bookbinding literature and was meant to introduce the bookbinding trade and its traditions to a lay audience. What tool could be more iconic in bookbinding than the bone folder and recognizeable to todays book workers and bibliophiles. BOOKBINDER: Well, even then it might not be possible to avoid using a blocking press to form some larger, more complex designs, for example a coat of arms or some specialized text elements. BIBLIOPHILE: No, Master, under no circumstances. In a work whose distinguishing character is determined by the work of the hands, there is no place for machines. If binders are so quick to switch back and forth between handwork and that of machines, they shouldn’t be surprised if their work becomes devalued. The masters of old were able to put large seals or coats of arms on their bindings, too, without resorting to a blocking press. There are two things that set this new edition apart from the past one. 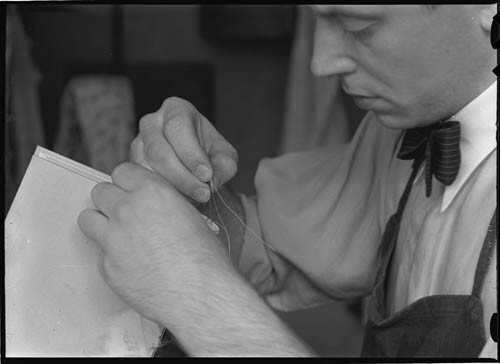 The first are the photographs of John (Hans) Schiff depicting the bookbinding process and taken after the publication of the Bremer Presse’s Faust being bound in 1925 and the emigration of Schiff to the US in the latter half of the 1930s. The photographs are also part of never published series of 34 original negatives, so publishing a selection of them is significant, especially as they are very rich tonally with a great detail. In selecting the images, Don Rash and I felt that it was important to show the hands of the binder at work in order to personalize the process. The images selected, one for each “day” in the text, depict: Sewing by hand over raised cords on the sewing frame; Sewing by hand over raised cords on the sewing frame; Attaching the boards to the textblock using the frayed ends of the raised cords; Sewing the headbands; Shaping the headcap on a leather binding; Gold tooling the board utilizing gold leaf and a decorative roll. The image of the bone folder working the leather over the cords is exclusive to the prospectus and not used in the text. The other thing that sets this new edition apart from the past edition, that yes was published open access online, is the completely new and greatly expanded introduction that provides much greater familial context to Ernst Collin and his background as the grandson and son of the last German court bookbinders describing their origins beginning with the early Jewish migration to Berlin in the first half of the 1800s, their growth as a significant trade bindery with close ties to the court and leading advocates for a new German bookbinding trade and tradition. Wrapped up in all this was the creation of the German empire, World War I, to the rise of Nazi Germany. The introduction also corrects several errors in Collin’s biography that were introduced in national bibliographies, edited correspondences, and elsewhere, disambiguating him from “the other Ernst” that lived in Berlin at the same time, and his fate of being murdered in the Shoah. It also gives a much better sense of the broad range of Collins writings, including describing the other translations and editions of The Pressbengel. In addition it provides a description of the life and work of John (Hans) Schiff, the photographer. This project became deeply personal to me when I was contacted by a geneologist who believed she was related to the Collins by marriage, and whose questions made me dig deeper into the history of the family and the writings of Ernst Collin. It was only appropriate that these findings be included in a new edition. Pairing this edition with the exquisite photographs of Schiff (who was able to escape Collin’s fate) makes the Don Rash’s Boss Dog Press edition even more special, and builds on the other titles he has issued on the topic of the German bookbinding tradition that to date have focused on the writings of his mentor Fritz Eberhardt who trained with Ignatz Wiemeler, among others. The prospectus provides more details on the edition of 100 copies that will be available in quarter leather, full paper, and sheets for binding – an edition that is seeing interest (and orders) from libraries, bibliophiles, and binders. 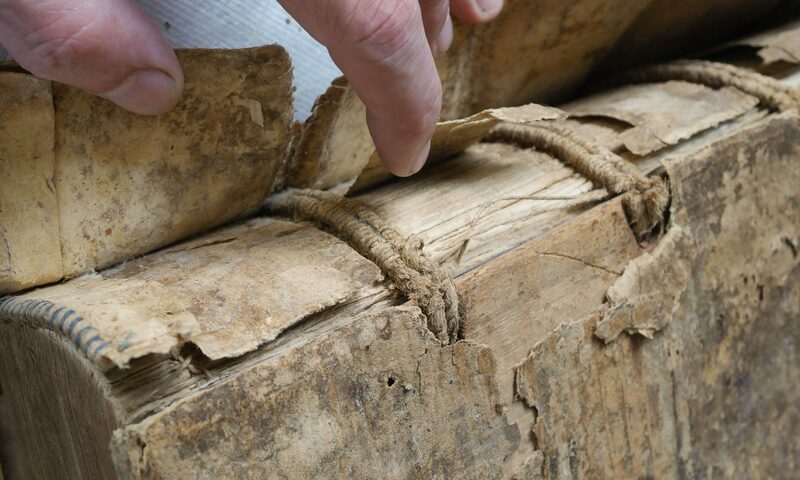 I would love to see an exhibit of the bindings that our peers create with the sheets, something more than the successful Bind-O-Rama on the downloadable sheets that have been available since the publication of the first translation in 2009. Ultimately, what is more attractive than a fine hand-bound book paired with original illustrations – no online/”e” text can duplicate that haptic experience. This has been one of the longest research projects I have undertaken, and the findings have been shared “in real time” via my Pressbengel Project blog under “Colliniana” and more formally in the The Collins: W. Collin, Court Bookbinders & Ernst Collin, the Author of the Pressbengel that I published online open access in English and German. Though I grew up bilingual, lived and worked in Germany for several years, and converse in German quite a bit verbally and in writing, doing this project bilingually was a real and significant challenge. In the end I am quite happy with the outcome as these texts include much more of Ernst Collin’s familial context, images of bindings and other items that W. Collin produced, and a “history of the life” with description of Ernst Collin’s writings that describe the German bookbinding trade, its practitioners, and the economic and political context of a dynamic yet turbulent time in Germany. The texts also include a title-level bibliography with chronological and subject lists of Ernst Collin’s known writings. None of this would have been possible without the digital collections that have come online, so the bibliography is also online on the Pressbengel Project blog along with links to a spreadsheet that includes links to the digital content where available. Together I hope that these contribute to closing the dearth of information on German bookbinding traditions lamented by Tom Conroy in his section on the “German Influence on American Hand Binding” that was published as part of his “Teaching Genealogies of American Hand Bookbinders” in the Guild of Book Workers’ Journal, Vol. 28, 1990.